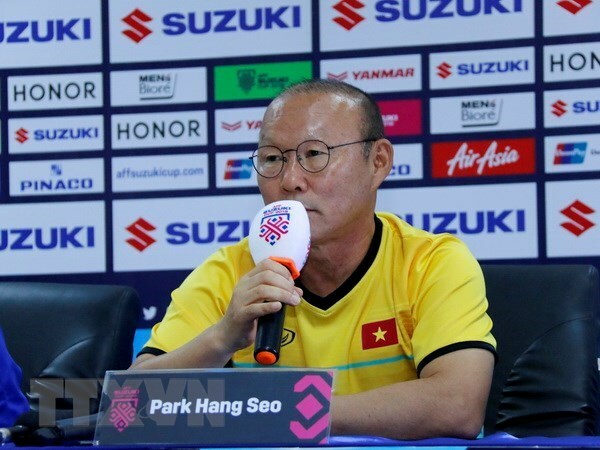 Vietnam head coach Park Hang-seo has said that the Golden Dragons will find a way to hurt their Round of 16 opponents Jordan when the two teams meet at the Al Maktoum Stadium in Dubai on Sunday. The AFF Suzuki Cup 2018 champions scraped through to the Round of 16 ahead of Lebanon, thanks to their better disciplinary record, as the last of the best third-placed teams in the continental championship. Jordan, their next opponents, upset reigning champions Australia 1-0 and defeated Syria 2-0 to progress as the table toppers in Group B. And Vietnam’s South Korean tactician knows it is going to be a tough challenge for Vietnam on Sunday. “We have already played strong teams in this competition, such as Iran and Iraq,” Park said in the news conference ahead of the Round of 16 tie. “Jordan are also well organised and well prepared and that’s why they got first place in their group ahead of Australia,” he said. “[Sunday’s] match is not going to be easy, it will be tough but we will have to maximise our strengths to win. There are no perfect teams in the tournament, and we will find their weakness,” the former DPR Korea international sounded a warning to the Jordanians. The 60-year-old coach said that he believes his Vietnam side will be fully ready for Jordan. “At this moment, we are not 100 per cent prepared for the match, but we will have a meeting with our technical staff and players [on Saturday night],” he said. “However, after analysing two Jordan matches, we can conclude that they were playing with a more aggressive style against Syria and we expect they will do the same with us. But if we score first, it will be harder for them,” the Vietnam head coach said.